The kid is seriously thin, how old is he anyways? allright i'm done. i gotta say though, janez has alot of GT potential. Last edited by kubla khan; 04-23-07 at 12:37 AM. Haha, I'm both lighter and taller than him (if I've got his length correct, tho'). Nothing wrong with being skinny. Yeah theres no way hes 130lbs, Im 6' 135 and im no holocaust like that kid. Yes, he can climb and he's had some impressive results. Good for him because he won't be getting girls by running around in a speedo on the beach. Must have had the bike (with a couple of water bottles) on the scale too. There's no way in **** that that dude weighs one hundred and thirty imperial pounds. 115 sounds like a stretch too. I think adding a few pounds of muscle to 'em probably wouldn't hurt. It boggles my mind to think that this kid was also the U23 World Champion in the TT a couple of years back. 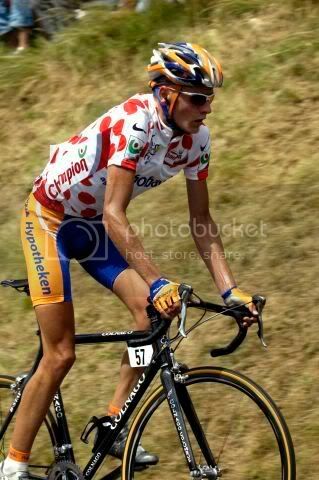 I mean seriously, who has that much sleeve space left in a race cut jersey?! i saw him in person on saturday & sunday & i'd say that he's about 125. the podium girls were bigger than he was. Vino said it best: "Slovenian Stick Insect"
Damn stick figure makes me look fat. not to worry! Most women like a little meat on their men. Next up on celebrity boxing we have a photon-weight division fight. A1: Ken it looks like both athletes really hit the cardio this time. A2: Sure thing Bill I think both of them have what it takes to go the distance. A1: I’m thinking this will go to a decision Ken. It doesn’t look like either one has knockout power. A2; I agree. Let’s take a look at the prize pool for today… Hmm it seem that the winner gets to watch the loser eat this, combined with a $5,000 donation to the diabetes foundation. i'll take rasmussen with his reach. these girls, esp the dark-haired one, we're pretty good. there were definately some ladies in the crowd & hanging around the buses (riders' girlfriends?) who could've been a lot better. So are you trying to say that he's too thin? 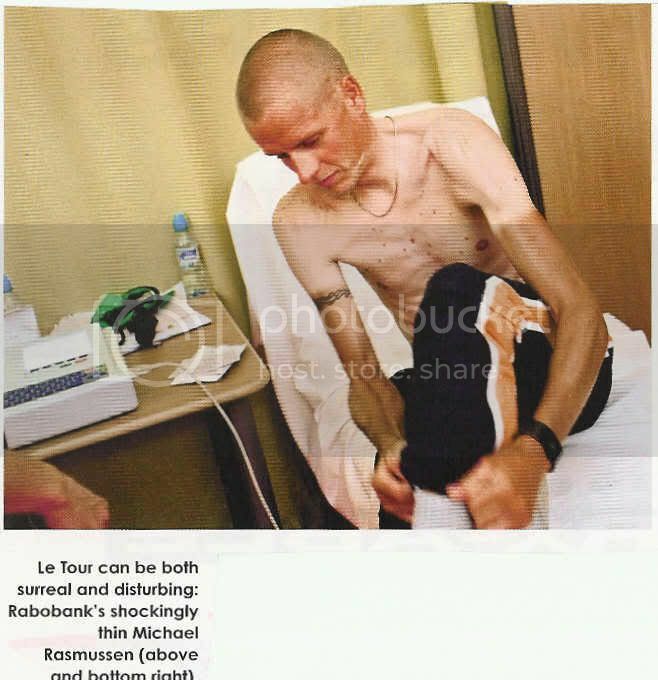 Yeah, I mean, he's so unhealthy looking – who would've thought that he just won a bike race. And he's a "natural" climber? Yeah, I heard those guys tend to be skinny. No way he is a pound over 120. His legs are way too small for that.